I was going to wait to bind my Snow Angel mat at the Woolwrights hook-in next month, but I needed something to work on this week. I decided to crochet the wool yarn around the edges and then do something more to suggest snowflakes. I single crocheted around it just fine, but when I tried to do the “fancy” stitches, I had a heck of a time. I must have started, ripped out, and restarted ten times. What a pain! I finally finished it and had to say, “Good enough”. Not every thing I hook is a masterpiece. It did reinforce the fact that I love binding using cotton clothes line. It gives a really nice neat finish. 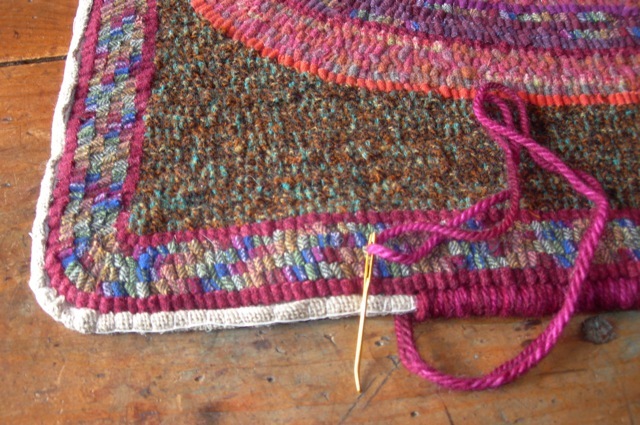 I’ve posted a photo below of a previous rug being bound this way. I’m a believer that if you find something that works, stick with it. I’m an old dog. Now it’s time to find a new rug to hook. As always, I do have a super secret rug to design, but I need something I can show as I work on it. I have an idea and will try to get it started this week. A good friend visited me this past weekend. She moved away, so it was great to see her and we spent some fun times running around to our favorite local haunts. Now it’s time to get back to work. There’s a lot of beauty out there and in spending time with an old friend. 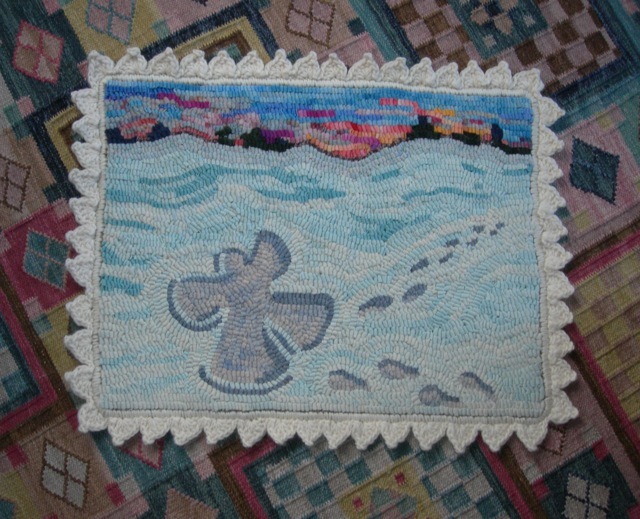 The completed Snow Angel rug with its fancy edging. This is my preferred method of binding. The linen edge is rolled over cotton clothes line, basted in place and then whipped with wool yarn.